Clockwise from left: Welcome to Dino World, Lord of the Rings: The Card Game, Game of Thrones Monopoly, and The Boldest. 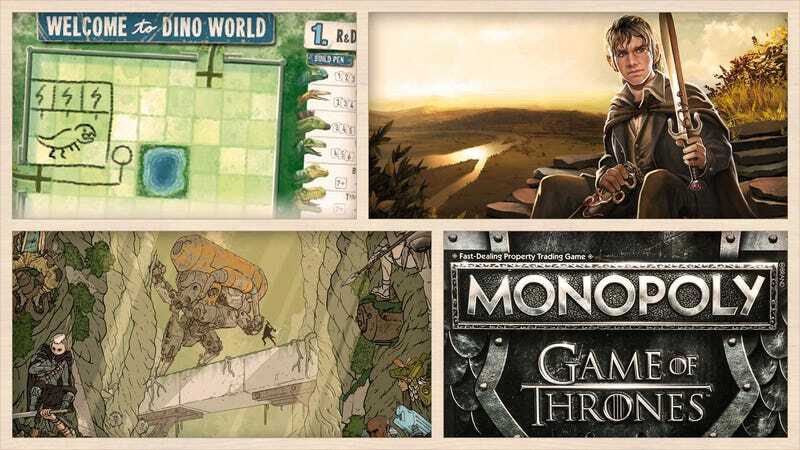 Welcome back to another installment of Gaming Shelf, our regular column where we look at the coolest board games and tabletop roleplaying games out there. This week, we’ve got a cool new Kickstarter for an Assassin’s Creed roleplaying game, the long-awaited arrival of Betrayal Legacy, and a whole bunch more. Didn’t spot any major expansions this week, but we’ll be sure to keep an eye out! Cover art and game cards for Rick and Morty: The Rickshank Rickdemption. Cryptozoic has released its latest Rick and Morty deck-building game, The Rickshank Rickdemption. Based on the second season of the animated series, this deck-building game also serves as a sequel to its previous release, Rick and Morty: Close Rick-Counters of the Rick Kind. In this latest version, players can use Council cards to do things like for votes for bids, or punish players. Oh, and by the way...there’s a Szechuan Sauce card. Don’t get too excited about finally finding the perfect Christmas gift for all the Game of Thrones fans on your shopping list. Hasbro’s new $30 Monopoly: Game of Thrones edition won’t be available until January of next year, which is tragic, because it’s the first version of Monopoly to incorporate music, specifically, the Game of Thrones theme, which plays through a miniature Iron Throne chance card holder that sits on the board. Other updates include the game’s banker becoming the “Master of Coin,” with gold dragon coins and silver stag coins replacing paper currency. Properties now include various locations from across the seven kingdoms, as well as faiths and orders that dominate Westeros. And instead of building houses and hotels, players erect holdfasts and castles to assist their ultimate goal of securing the throne—or just becoming stinking rich. Stronghold Games has announced more information and a release date for Futuropia, an economic game where players are striving to make societies that are so utopian that everyone works fairly and gets a decent amount of time off. Maybe one day...no one will have to work at all. Sounds pretty nice, right? As reported by The Gaming Gang, players do this by building self-sustaining homes and developments, making it so characters have as much free time for leisure as possible. Futuropia is set to come out in January 2019. The Race for the Galaxy board game series expands with New Frontiers, a new standalone addition by Thomas Lehmann that has players expanding their control of the galaxy by conquering new worlds, and then colonizing them with inhabitants who have to master diplomacy with other worlds (and players) if they want to thrive. It brings a new angle to the series, along with previous gameplay staples like developing new technologies to increase your might as your conquered worlds produce more more raw materials. Expect it to hit stores sometime this month. Your task is to play the very first scenario of The Lord of the Rings Saga Expansions—A Shadow of the Past—and make it out of the Shire with The One Ring in tow, but you are limited to only the tools and skills that Frodo and his companions had available to them in The Fellowship of the Ring. The challenge is in attempting to win this scenario with such an… interesting deck. Okay, it’s not a very strong deck. But that’s part of the fun! This was a dystopia we were not ready for. Netflix’s Black Mirror has come out with a new board game from Asmodee, and it’s all about counting your social credits so people think you’re totally awesome. Based on the episode “Nosedive” starring Bryce Dallas Howard, the game challenges players to create the “perfect” social life using both cards and a digital app that checks your Social Score. It will arrive on Target shelves November 25. If you like your games to be as lovely as they are challenging, The Boldest, from Stronghold Games, features over 100 unique illustrations from artist Max Prentis bringing the mystical forest known as the Iron Valley to life. Two to five players use their hands to build three groups which participate in expeditions into the mysterious forest each round, working to defeat mechanical menaces and collecting rare artefacts along in the process. Each game can be completed in as little as half an hour depending on the number of players, and The Boldest is expected to hit stores sometime early next year for about $80. Man versus nature is a popular theme in fantasy gaming, and it takes center stage with Haven, a new two-player title from Red Raven Games which has one player taking the role of a mystical forest full of spirits, animals, and powerful beings, trying to protect it from the other player who controls a nearby city which has developed devastating machines, and a desire to harness the power of the woods. It’s available now for $25. That’s a lot of accessories. The time has come! Betrayal Legacy is now available. We’ve been looking forward to this one for months. It’s a Legacy edition of Betrayal at House on the Hill, a popular horror game. This one takes place over the course of a year, and you’re left with a unique board afterward. Players take on the role of their characters at different stages of their lives—if someone dies, then one of their descendants might take over. We’ve got a copy and will be busting it out next week! Taking place between Brotherhood and Revelations, this cooperative board game has play as a small team of Assassins, trying to build the new assassins headquarters while fighting off guards and templars. It’s already been fully funded, and will be on Kickstarter through December 6. IDW Publishing is turning Jim Zub and Steven Cummings’ Wayward comic book series into a cooperative board game for one to five players who each take the role of a teenager with newly developed super powers. In the game the teenagers work together to stop the Weave, a guiding force behind the world, from unraveling, while creatures known as the Yokai work to prevent the teens from taking power. Wayward Board Game - Signature Edition will start life on Kickstarter in February of next year, and those who choose to pre-order the game for $70 will get a version with upgraded packaging, miniatures, and a bonus character with their own scenario. This is a narrative horror game where players try to survive a house of horrors where each room is more terrifying than the last. Players are each working toward getting the big $10 million prize, which means a lot of betrayals and backstabbing... sometimes literally. But that’s okay, as death doesn’t necessarily mean you automatically lose. It’s a relatively gruesome-looking game, so not something for the kids. Grind House will be on Kickstarter through December 1. Arcane Alley is about witches and wizards trying to sell their magical goods on the black market. Mixing a bit of Sheriff of Nottingham with Harry Potter’s Diagon Alley, it’s about getting more people to buy your stuff while avoiding the inspectors. Arcane Alley will be on Kickstarter through November 29. Few of us are on track to develop and build our own dinosaur-filled theme parks in real life. But if you’ve got a Jurassic-sized itch to scratch, Dino World could satisfy your John Hammond fantasies. The “roll and write” game has up to 150 players (or potentially more, depending on the variation you’re playing) designing and drawing their own dino-filled amusement park based on the roll of three dice. You also need to make sure each dino pen has enough power to keep your prehistoric attraction contained, and various gameplay modes have you working to attract visitors, or contain a potential disaster if a dino does escape. The game can be pre-ordered with a contribution of just $27, and is expected to ship sometime in May of next year. If customization ranks high on your demands for a role-playing game, the creators of Emberwind describe it as having a “modular game engine” so that it can be adapted to whatever flavor of tabletop quest you’re after. The “Core” version of Emberwind is being crowdfunded with a modest funding goal of just under $19,000, with a $32 contribution required to pre-order a printed edition when it launches in June of next year. The price goes up from there if you want to add campaign sets, all the way to a staggering $3,500 if you want to learn how to play it during a seven-hour session with the game’s creators. Ever wonder why Guess Who? had so few female characters? Well, now you don’t have to! A new game has players guessing the identities of real women from history, focusing on their achievements and accomplishments. It’s a great way to have fun and learn about some exciting women and how they helped change the world. Who’s She? has already been fully funded, and will be on Kickstarter through December 6.